hile many know Fr. George Rutler as an inspiring preacher, a profound author, an erudite theologian, and a commanding television personality, perhaps few are aware of his musical talents. He developed a love and talent for the music of the Church from his youthful days as an Episcopal chorister in New Jersey to his piano studies and his immersion in the treasury of church music in Oxford and Rome. He self-effacingly admits to being a "rank amateur" composer, but as in every area of his life, Fr. Rutler never proceeds timidly or half-heartedly into the task. "We must cultivate good hymnography," he writes, to counteract the trend toward insipid hymns, heretical verse or "gratuitously bowdlerized texts." Fr. Rutler's views on liturgical music and hymnography are a reflection of his lifelong service to the Lord. His journey of faith began in the Episcopal Church. An interest in the Classics led him to Dartmouth and to Oxford, and after his studies at General Theological Seminary in New York City he was ordained to the Episcopal priesthood. His analysis of the writings of John Henry Cardinal Newman and Karol Cardinal Wojtyla fueled his uneasiness with the authenticity of Anglican primacy. As the youngest rector in the United States (at an Episcopal church in Rosemont, Pennsylvania) he also served as chaplain to nearby Bryn Mawr College. His life, while pleasant, was peculiarly unfulfilled. He sought a higher goal, a mission rooted in Gospel principles rather than cultural and social structures. He was elected National President of the American Church Union, a loose federation of loyalists with roots in the Oxford Movement energized by Cardinal Newman. Certain events - the Angican Communion's ordination of women and the local Episcopal church's support for abortion - led to his decision to pursue union with Rome. When the ACU balked at the idea of approaching Catholicism en masse, and having resigned his position as rector, Rutler decided to embrace the Roman Church alone. Karol Wojtyla had been elected Pope John Paul II in 1978. He was a strong figure who had lived through and defied many of the evils of modern society: atheism, communism, secularism. Fr. Rutler saw and admired in this new pope a fiery evangelism and a gift for preaching the word of God with authority. The times were ripe for a new course in his life. "It was quite clear that the Holy Spirit was doing something miraculous, and I wanted to be a part of it." 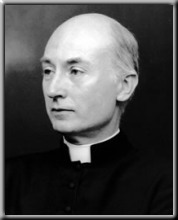 George William Rutler was received into the Roman Catholic Church with the blessing of Terrence Cardinal Cooke on September 28, 1979, in Saint Patrick's Cathedral in New York City. He continued his studies at the Angelicum in Rome, living at the North American College, with a goal of being ordained a Catholic priest. He returned to Rome after his ordination by Cardinal Cooke to finish his doctorate. He also holds advanced degrees from Johns Hopkins University and Oxford University. As a priest of the Archdiocese of New York, Fr. Rutler has served in several parishes in New York City, including Our Lady of Victory (Wall Street), Saint Agnes (43rd Street), and The Church of Our Saviour (Park Avenue). He continues to preach by word and example the Gospel message of Jesus Christ. His many books, journal articles, EWTN programs and homilies offer a vehicle "to challenge people with the demands -- and the splendor -- of sanctity." From his church in Manhattan, Fr. Rutler was quick in responding to spiritual needs during the crisis on September 11, sacramentally anointing fireman, policemen and victims at the World Trade Center towers.